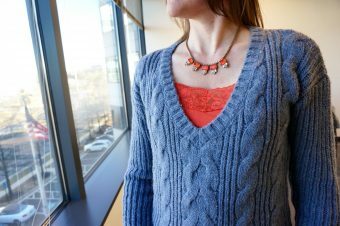 This is the second post in a 10 part series on how to wear the Pantone Seasonal Colors (Flame). For posts on the other colors visit the Pantone Seasonal Color Page. I am torn between Pale Dogwood and Flame as my two favorite color choices for the season. How can you not love a color named Flame. This color is bright and bold and screams “notice me”. According to Pantone, “Flame is gregarious and fun loving. Flamboyant and vivacious…” Unlike Pale Dogwood this is a color that would be hard to pull off as a base neutral but is perfect as an accent or statement color. To incorporate this color into your wardrobe, find pieces with subtle hints of Flame in the stripes or abstract pattern. For the best results combine flame with a neutral base like navy or black. The above shirt incorporates Flame subtly and combines beautifully with Lapis Blue and navy. I would pair this with a navy pencil skirt or pants if you are feeling conservative. Feeling bold? Go for the Flame colored skirt (see below for where to buy)!! Looking to go all out? Include more bright colors. This dress is a perfect example of a bold Flame choice. It is paired with other bright seasonal colors (Pink Yarrow or Primrose Yellow). Wear this with a navy suit jacket or blazer for a more office appropriate look. One of the easiest ways to incorporate this color is with statement accessories. I love using shoes to create interest in outfits (and I have a closet full to back that statement up as my husband frequently reminds me). These are the perfect shoes for wearing Flame at the office. Tweed – yes! Plaid – yes! They are complimented by a neutral blue color but the Flame component cannot be ignored. Beautiful! Alternatively make one of your pieces the statement and keep everything else neutral or even monotone (replace the white silk blouse below with a navy one for the monotone look). My shoes and skirt are both from Boden (unfortunately last season). But Boden is one of the best sites to look for Flame (as well as Primrose Yellow and Lapis Blue). I just received their latest catalog and their spring collection is chalk full of beautiful pieces. The Two Court Heels are exquisite! Pair with the Amy Knitted Dress and you have a work appropriate outfit ready-made in only two pieces.